Lanzarote Weather in December - Looking for a warm winter holiday? Lanzarote is one of the smaller islands in the archipelago, but this doesn't mean it falls behind on the weather front. Winters in Lanzarote are mild and warm, as in all the Canaries, so if you're planning a sunny Christmas, Lanzarote might be a great choice. How warm is Lanzarote in December? In December you can usually still enjoy most days on the beach, catching up some sun and getting a bit of colour on your skin. In the evenings you will definitely need a cardigan or jacket, so be sure to pack one for your trip. We've said this before and we'll say it again when talking about the weather: due to climate changes, it has become really difficult to predict the weather according to a pattern. Usually in December in Lanzarote the island gets its fair share of rain, meaning that this month is probably the one with the most rainy days out of the entire year. But if you're planning on spending Christmas in Lanzarote, don't be put off by this fact. Although we can't assure the fact that you'll be spending Christmas day on the beach, we can tell you that rain doesn't usually last for long here. It's violent and hard and sometimes comes along with strong winds, but it does not last for more than 3 consecutive days. Usually during the day time you can still spend time on the beach and UV protection is still mandatory, as you will burn your skin otherwise. In December temperatures are usually in the low 20s°C during the day time, but it can feel a lot warmer when the sun is out. It also depends on the wind in each specific day, as it can feel cooler when the wind is blowing hard. We've found that Playa Blanca is more sheltered from hard blowing winds and Costa Teguise tends to be on the windier side. But this is our personal observation and we're sure that people who are frequent visitors to the island will return to the place that they love most in Lanzarote, a decision which is not based on the amount of wind it gets. If you're planning your first visit to the island, then you might want to read more about where to stay in Lanzarote during your holiday. 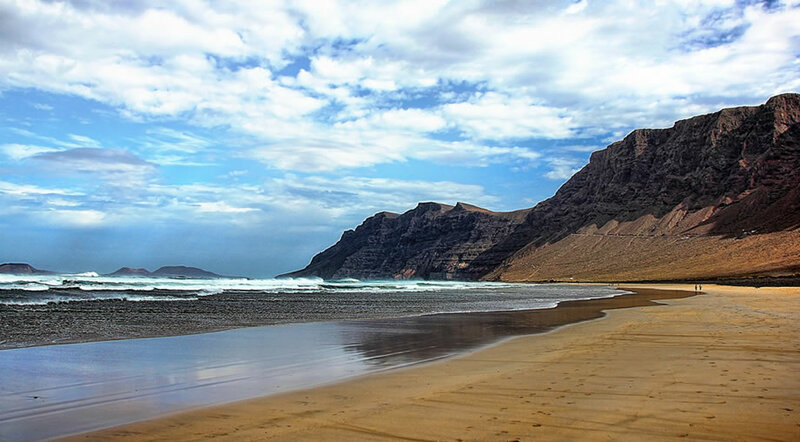 What should you expect from a winter break in Lanzarote in December? You should definitely expect some warm winter sun, but don't be surprised if you get some rainy days as well. Or at least cloudy and cool. December is still the beginning of winter even here in Lanzarote, so the season is changing. We're not trying to talk out out of coming to Lanzarote in December during the winter holidays, we just want you to have realistic expectations, so that you won't be disappointed. It's better to be pleasantly surprised if you only get warm sunny days during your holiday here. Christmas at the beach is always a possibility in Lanzarote and it's a nice break from the typical image of a white snowy Christmas. What about rain in Lanzarote in December? Like we said, the island usually gets some rainy days, but it won't last for a week like it does in the UK. You have plenty of things to do in Lanzarote when it rains, as the island has lots of places to visit and you can even do some shopping, especially in Arrecife. You could also visit Cueva de los Verdes, since the tour takes you inside a volcanic tube anyway and the rain won't bother you there. The water temperature is usually warm enough for you to swim and we have been in the water in December, as well as January and it was ok - not super warm like in the summer, but warm enough to still enjoy it. So...should you go to on holiday to Lanzarote during the month of December? If you are happy with some winter sun (without the extreme temperatures of summer) then yes, you should go to on holiday to Lanzarote this month. Christmas and New Year's are really different and special when you're able to walk in the sun wearing just a T-shirt, but this obviously depends on personal preference (we're not big fans of a Christmas in the snow or on the mountain slopes). Is Lanzarote hot in December? It is warm but it's not HOT. When most people think of hot weather they imagine temperatures well above 30°C and this is unlikely to happen. Although, with the climate changes that we're seeing, nothing is certain anymore. But Lanzarote still gets at least 6 hours of sun per day, which is far more than most other places in Europe. Also, it will probably be warm enough for you to spend your days wearing just a T-shirt and shorts, but you'll have to get a jacket on at night.